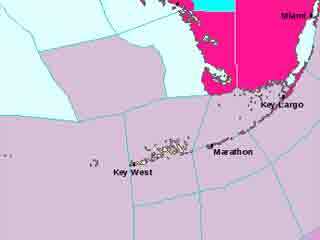 Key West is said to be the only town in the lower 48 states have never had a freeze. Due to the proximity of the Gulf Stream from The Gulf of Mexico in the Straits of Florida, about 12 miles due south and southeast, plus the tempering effects of the Gulf of Mexico located to the west and north, the city of Key West has a generally mild, tropical like climate. Rain comes in dry and wet seasons. The months of November through April get lots of sunshine with slightly less than 25 % of the years rainfall. The rain usually takes place ahead of cold fronts in a several heavy or light showers. May on through October is usually the wet season, getting about 50 % of the yeas total in several showers and thunderstorms. Rain falls most every day of the rainy season. Each morning is the most likely time for these types of showers, which is not the same from mainland Florida, in which showers and thunderstorms mostly occur in the mid afternoon. Tropical waves from the east occur during this season and sometimes bring massive rainfall, while less frequent hurricanes can be accompanied with not so usual heavy rains. None the less, Key West has the least amount of rain in Florida.